As intimated above, I didn’t manage to make it here until 9pm, so I’ve missed Evolver and Kinnie the Explorer. 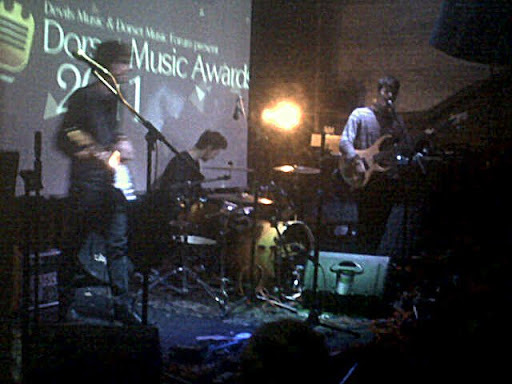 What I can’t miss is the capacity crowd – the Dorset Music Awards always pull out a lot of fans and also other musos, from within the competition and without. Rapids go on as the third act of the evening, my first. They are energetic and loud, yet not to a volume where earplugs are needed. Front man Matt is kicking around all over the place, they are very high energy rock, pacey beats, fast bass and rhythm guitar riffs with screaming lead, and a bit of synth thrown in for good measure. A bit of flavour is added by Matt jumping into the crowd and jumping away while still shouting the lyrics. The applause is polite, with a few whoops and cheers; there isn’t a lot of other movement going on to match the high energy performance. I’m therefore a little taken aback by the noise when they’ve finished – they’ve clearly won some people over. This time the audience seem to be behind them more – more swaying for the slower numbers; more movement for the swifter elements. Something strange, Ed seems to have his own personal roadie – even to the point of plying him with a drink while he’s playing – turns out there are 3 songs without a break for bass and he’s thirsty! At the end as part of their last song, Ed is clearly looking for something special – he steps forward to encourage some mates to start moshing, then jumps down into it – still playing bass – to join in. Cue close of set with tons of feedback…. They bring a different summer evening vibe – a feeling of calm and stillness. Well, to the front half of the room who are still paying attention – those round the bar appear to have lost interest. I think it’s more the nature of Saturday Sun’s music that these noisier people can be heard over the quieter tunes. As ever with the Dorset Music Awards, a big shout goes to Trevor and Richard from Dorset Music Forum for organising and running another amazing night of live music in Bournemouth.